At first glance, Christmas may not seem like the best time to go away in your caravan. With plunging temperatures, long dark nights and the distinct possibility of snow, setting up camp in your caravan during what could possibly be the coldest time of the year might not seem like the best idea in the world. However for a large number of hardy caravaners, it is their favourite time to get away and have fun with the family. Imagine waking up on Christmas morning in your cosy caravan looking out over a frost covered valley, snow covered mountains or a deserted winter beach. Generally speaking, modern touring caravans are well equipped and insulated for winter use because caravan manufacturers have been listening to customers who want the option of touring during all seasons of the year. Plus with many UK campsites open all year round, a Christmas caravanning holiday could be the perfect way to spend the festive break, giving you the opportunity to enjoy beautiful campsites in relative peace and quiet, particularly in comparison to the busy summer months. Winter weather can be unforgiving, so it is advisable to research campsites carefully. Try to avoid pitches at the bottom of a valley where water may collect, and site your caravan close to a hedge or wall to act as a windbreak. It is also important to check that your chosen site is fully functional, with water and basic utilities open and available to campers. 5. 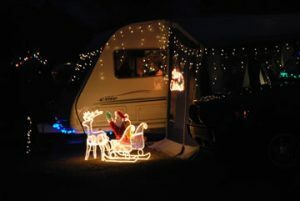 Decorations – a festive looking caravan with a miniature Christmas tree, tinsel and fairy lights (both inside and out) has a distinct magical and festive feel to it. Be as eccentric and bold as you like, turning your caravan into a real-life Santa’s Grotto – the kids will love it! 6. Outdoor clothing – winter is the perfect time to enjoy the stillness of the countryside, but do make sure that you are fully prepared for the harsh outdoor conditions with wellington boots, walking boots, thermal clothing, waterproof jacket and trousers, hats, scarves, gloves, etc. 7. Christmas dinner – why not save hob space by cooking your turkey outside on the BBQ? Citizens of Australia and the USA have been cooking their turkey this way for decades and swear by the method; producing succulent and juicy meat. So, if you are looking for a different way of spending Christmas this year and like the sound of an adventure, why not pack up your caravan and take off to one of the many campsites that are open during the festive season. You might just get hooked!